Remember the days before there was email? Yes, those days you had to write your message put it in an envelope and bring it to the post office that would bring it to where it has to go and that could take days. Lucky for us there is email now but to remember the good old days of snail mail you should be wearing this t-shirt. On the shirt, you can see a snail and it seems to be hard at work as it has a bunch of letters on its back some even love letters based on the hearts on it. 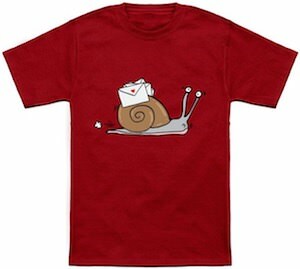 You can get this snail mail t-shirt in styles for men and women and it is available in many colors and sizes Small – 6XL.